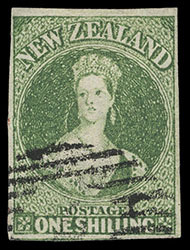 New Zealand, 1862, Queen Victoria "Chalon Head", 1s bluish green, imperf, Large Star watermark, unused without gum, full to large margins, beautiful brilliant color on bright paper, Very Fine and choice unused example. Scott No. 15g. Campbell Paterson No. A6d (1). SG No. 44 var. £2,500 ($3,280). 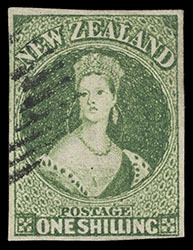 New Zealand, 1862, Queen Victoria "Chalon Head", 1s bronze green, imperf, Large Star watermark, cancelled by light numeral "1" barred oval of Auckland, large even margins all around, strong color and sharp impression on bright paper, fresh and Extremely Fine, Antipodes, Corinphila, September 1988, lot 3374; with 1963 B.P.A. (Green shade) & 1991 P.F. (Deep Green shade) certificates. Scott No. 15g var. Campbell Paterson No. A6d (5). SG No. 44 var. £325 ($430). 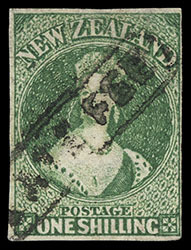 New Zealand, 1862, Queen Victoria "Chalon Head", 1s emerald green, imperf, Large Star watermark, full to huge margins showing part of adjacent stamp at right, used with two 1864-71, 6d red brown (122) singles, one faulty, each tied by bold numeral "7" barred oval, matching "Wellington, New-Zealand, JU 14, 1865" rimless origin backstamp on cover to Chelsea, England, red "REGISTERED" straightline, red London "Registered, S.W.D.C., AU 21, 65" entry cds; cover lightly cleaned, Fine and rare combination registered use to the United Kingdom; with 2014 B.P.A. certificate as normal 1s yellow-green. Scott No. 15 var. Campbell Paterson No. A6d (2). SG No. 44 Estimate $750 - 1,000. New Zealand, 1862, Queen Victoria "Chalon Head", 1s deep yellow green, imperf, Large Star watermark, full to huge margins, deep rich color on bright paper, light barred oval cancel, fresh and Extremely Fine. Scott No. 15 var. Campbell Paterson No. A6d (4). SG No. 45 var. £350 ($460). 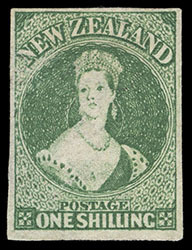 New Zealand, 1862, Queen Victoria "Chalon Head", 1s yellow green, imperf, Large Star watermark, neat strike of barred oval, clear to large margins, rich color with a sharp impression, fresh and Very Fine. Scott No. 15. Campbell Paterson No. A6d (3). SG No. 45 £350 ($460). 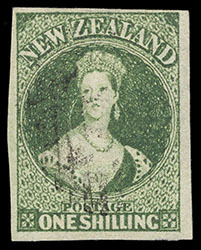 New Zealand, 1862, Queen Victoria "Chalon Head", 1s deep yellow green, imperf, Large Star watermark, lightly cancelled by barred oval, full to large even margins, strong color and impression, Very Fine and pretty, Alfred H. Caspary, H.R. Harmer N.Y., October 1958, lot 305. Scott No. 15 var. Campbell Paterson No. A6d (4). 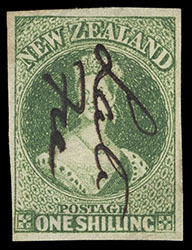 New Zealand, 1862, Queen Victoria "Chalon Head", 1s yellow green, imperf, Large Star watermark, large margins all around except close at bottom left, strong rich color on bright paper, bold manuscript "Late Fee" cancel, Extremely Fine and choice. Scott No. 15. Campbell Paterson No. A6d (3). The 1sh stamp used to pay the late charge on letters to the UK & Australia from January 1, 1864 to July 17, 1867. 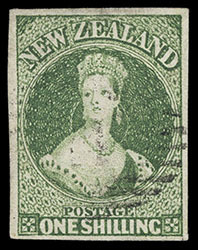 New Zealand, 1862, Queen Victoria "Chalon Head", 1s bluish green, imperf, Large Star watermark, clear to large margins, bold strike of boxed "Late Fee" cancel, some light creases and small repair at bottom left, Very Fine appearance and rare cancel. Scott No. 15. Campbell Paterson No. A6d (1). The 1sh stamp was used to pay the late charge on letters to the UK & Australia from January 1, 1864 to July 17, 1867. 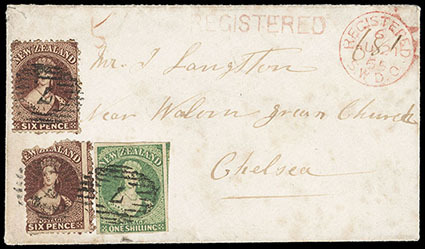 New Zealand, 1862, Queen Victoria "Chalon Head", 1s green, imperf, Large Star watermark, four large even margins, tied by indistinct numeral "1" barred oval, matching "Auckland, MY 31, 1863" backstamp on blue cover to Hull, England, endorsed "Via Marseilles", reverse with Hull (8.15) arrival cds; cover tear and flap torn, vertical file fold affects 1s, Fine and scarce use. Scott No. 15. Campbell Paterson No. A6d (3). SG No. 45 Estimate $750 - 1,000. Letter prepaid 1sh for a ¼-½ oz. letter to the United Kingdom via Marseilles. 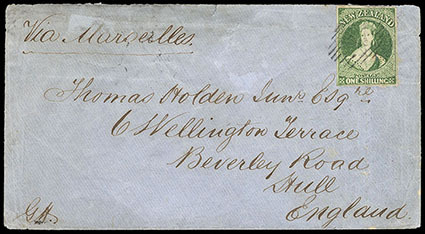 New Zealand, 1862, Queen Victoria "Chalon Head", 1s yellow green, imperf, Large Star watermark, four margins, used with 2d pale blue (38) four margins, each cancelled by numeral "2" barred oval, matching "Russell, New-Zealand, AP 11 1864" origin backstamp on buff cover to Fall River Mass., reddish manuscript "8" pence credit rating to G.B., red "London Paid" (7.13.64) transit cds also ties 2d, red "16/Cents" credit to U.S. handstamp, "N.York Am. Pkt. 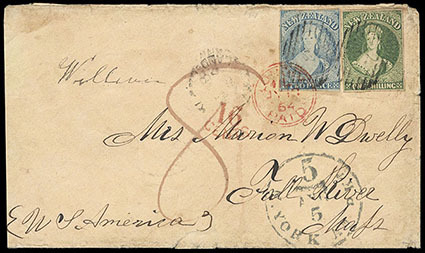 '5' Aug 5" debit exchange cds, Fall River (8.6) arrival cds; some cover edge wear, reduced slightly at right, Fine and rare one shilling use to the United States. Scott No. 15. Campbell Paterson No. A6d (3). SG No. 45 Estimate $1,500 - 2,000. This cover was prepaid 1sh 2d for a ½ oz. letter to the United States via Suez and the United Kingdom.